“You smell like barbecue,” remarked my three-and-a-half year old little boy, upon taking a deep sniff of my forearm. It was true…after overseeing our grill, which now housed a box of smoldering wood chips, I was definitely radiating smoke. I took his comment as a compliment – I love the aroma of wood smoke. Somehow it smells even better when it’s emanating from your own backyard, prepared to flavor the food you’re about to grill. I was pleasantly surprised to discover how easy it is to turn your gas grill into a smoker! As you make your grilling plans for Labor Day this weekend, let me share this advice: think smoke. 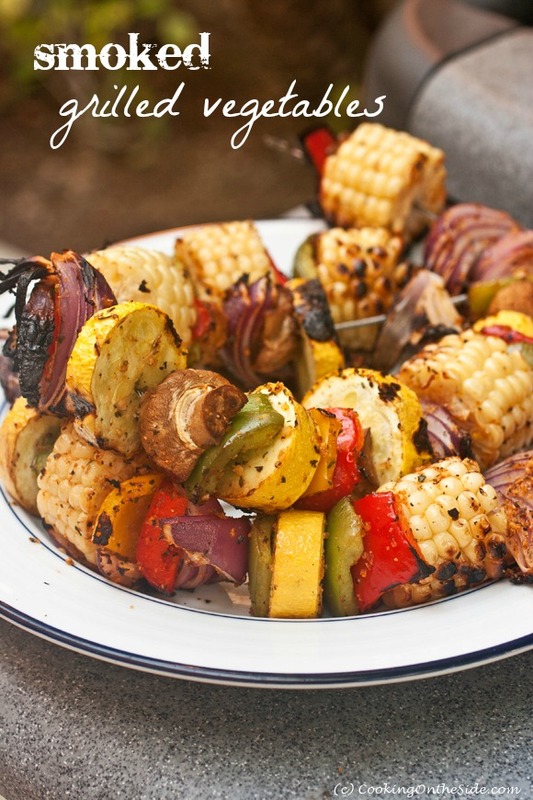 Today’s recipe for Smoked Grilled Vegetables takes ordinary grilled vegetables to the next level. 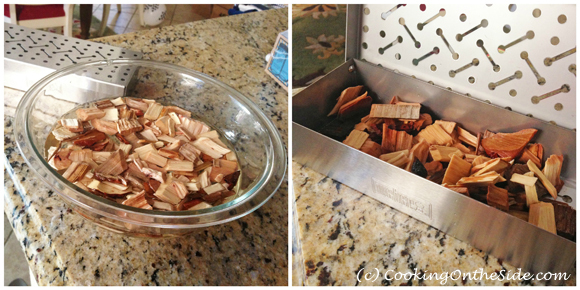 You can make a foil pouch to hold the wood chips (here’s Martha Stewart’s advice for Grilling with Wood Chips), but I went ahead and picked up the stainless steel smoker box that’s designed for my grill. McCormick sent me some pecan wood chips (Smoke & Spice Pairings is one of the summer grilling trends in McCormick’s Grilling Flavor Forecast), which are sweet, nutty and mild and pair well with almost anything. I let the chips soak, then transferred them to the smoker box and onto the hot grill. While the wood chips soaked, I had plenty of time to prep the vegetables – corn on the cob, yellow squash, peppers, mushrooms and red onions – toss them with Montreal Chicken Seasoning and a little oil and thread them onto the skewers. It was my first time using this type of flexible skewer (McCormick sent these along as well) and I found them to be rather convenient. 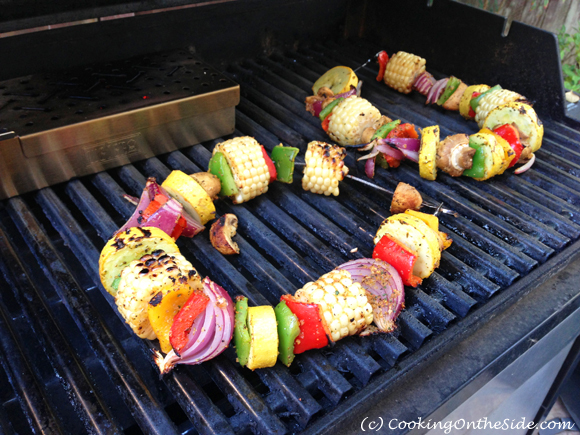 The skewers ended up looking like colorful vegetable necklaces (leis, even) on the grill! By the way…the recipe below says to position the smoker box under the grill rack, but I defaulted to the directions that came with my box which recommended placing it on top of the grates. Next time, in hindsight, I’ll try moving it under the rack, as I had a few issues with flare-ups when I opened the lid to turn the vegetables and air reached the box. It’s a good idea to keep a spray bottle of water nearby when you’re grilling! If you’re wondering whether you can taste a smoky difference in the vegetables, the answer is yes, you can! I tasted the smoke most prominently in the peppers. The smoke truly deepens the flavor, and the technique isn’t difficult at all to pull off. You’ll want to add this to your grilling repertoire! Meanwhile, toss vegetables with oil in large bowl. Sprinkle with Seasoning; toss to coat well. 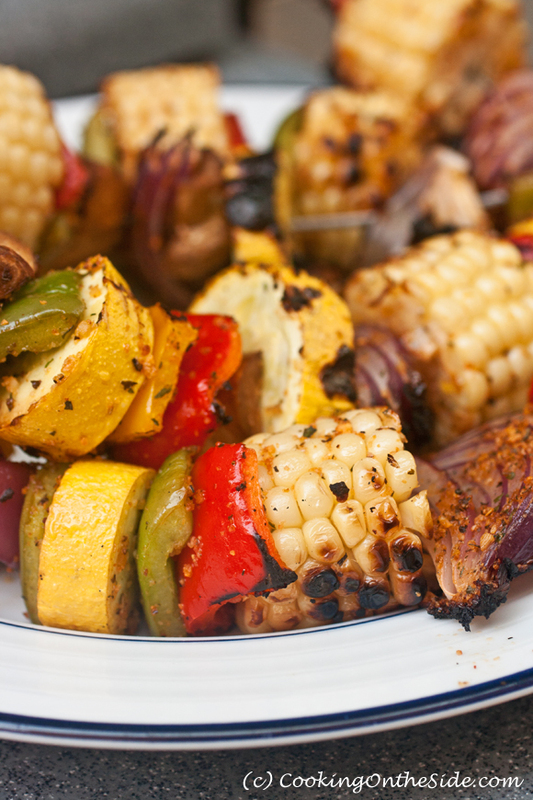 Place vegetables in grill basket, grill rack or thread onto skewers. Close lid. OMG…I feel sooooo bad today…b/c…I’ve cheated my taste-buds! Instead of gettin’ that dry-cheeseburger from McD’s, I could’ve grilled me some veggies instead! I’ll know better the next time!!! That pic looks good enough to eat (smile)!!! ‘“You smell like barbecue,” remarked my three-and-a-half year old little boy’ – is definitely a compliment. Cracked me up! And thanks for a great post. I love adding that smoke flavor to pretty much anything!